If you value your marriage, you will do anything to protect it. At the end of the day, nothing is more valuable like couples standing up for each other and protecting what they truly love and put more value on. While there aren’t frequent instances of questionable marriages, you may need to file an affidavit if and when requested. As such, you should consider using sample forms to save you and your significant partner a lot of time. 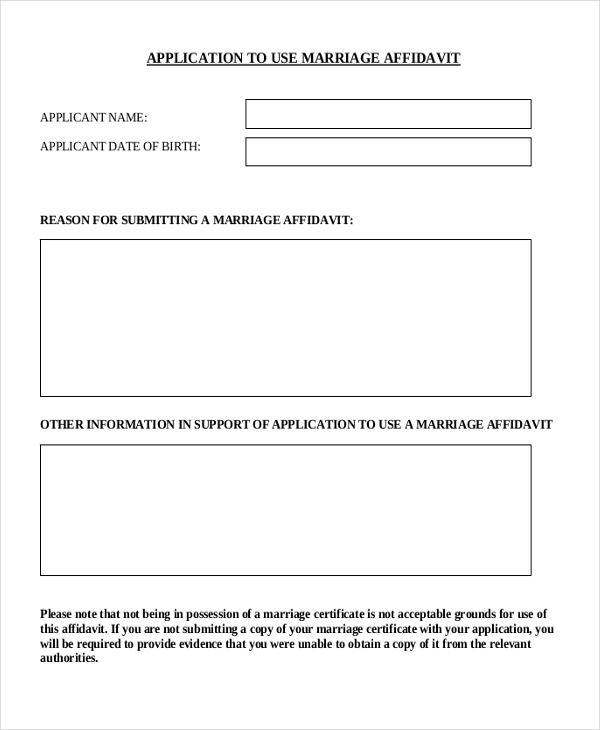 Here is a list of the Affidavit Forms. If you think that there are people out there busy questioning your marriage, this is the best form to use to prove them wrong. It has a section for the signature of couples. 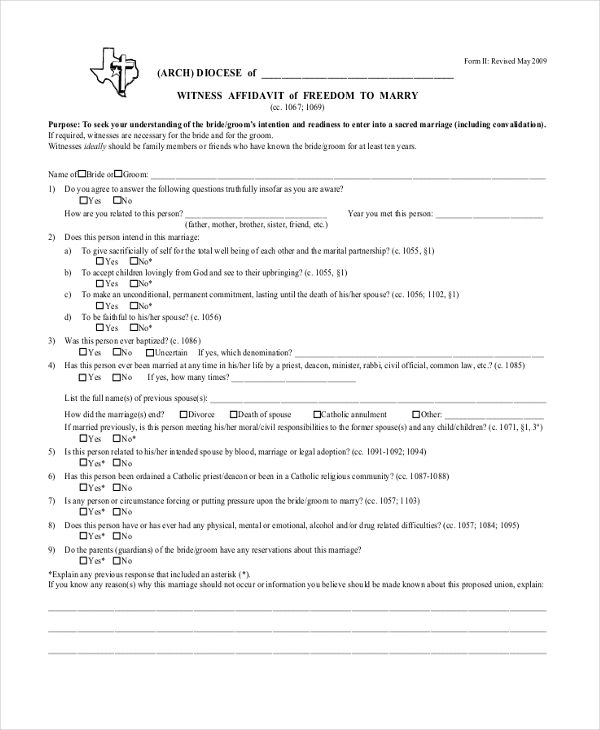 If someone out there is questioning your marital status, you can use this sample form to provide them with the information they need. 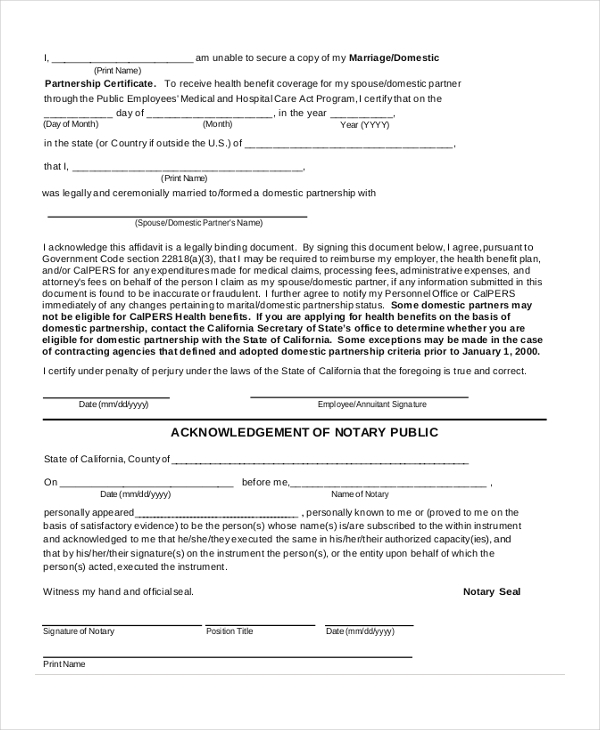 Remember to input your signature on the document. Proof of marriage is necessary although not always demanded. 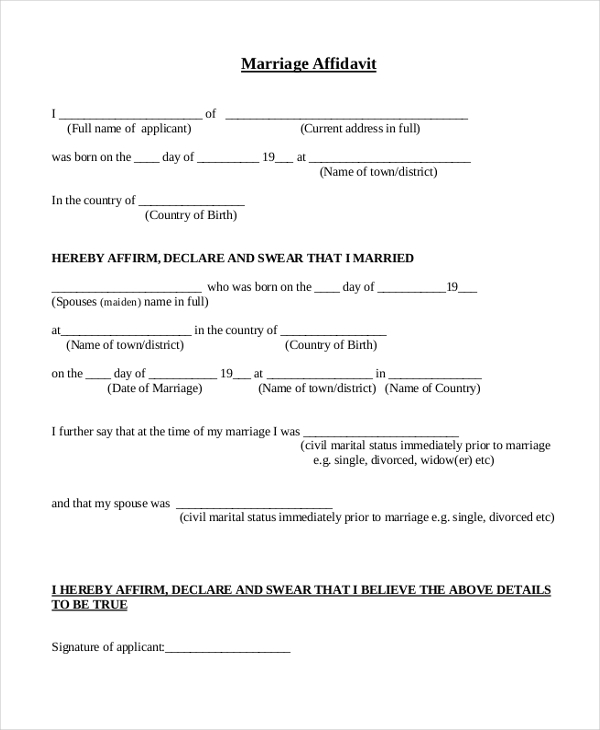 If you still must provide proof of your marriage at the end of the day, here is a suitable form that you can use to provide accurate information. This form is about 11 pages. So, you need to spare enough time to read it before filling it out. Creating this form from scratch is not an easy task. But you are lucky you can download it for free. At the end of the day, it may be necessary to provide information to support your claims of being a legally married person. And you can use this sample form to do just that. If you required of providing information about your marital status, it would be best if you use a marriage affidavit form. Here is sample template that you can download and use to provide necessary information. 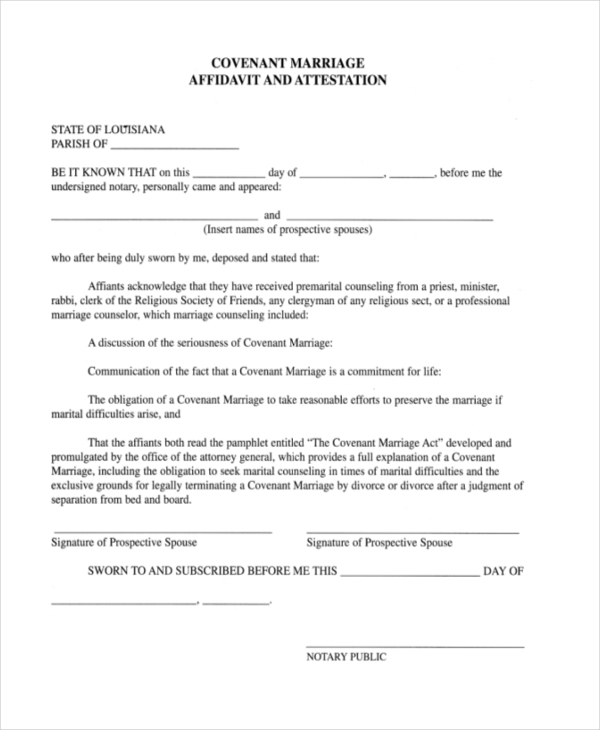 If you signed a covenant to marry someone and yet people around you do not know about it, you can use an affidavit to inform them. The sample template is available for instant download. 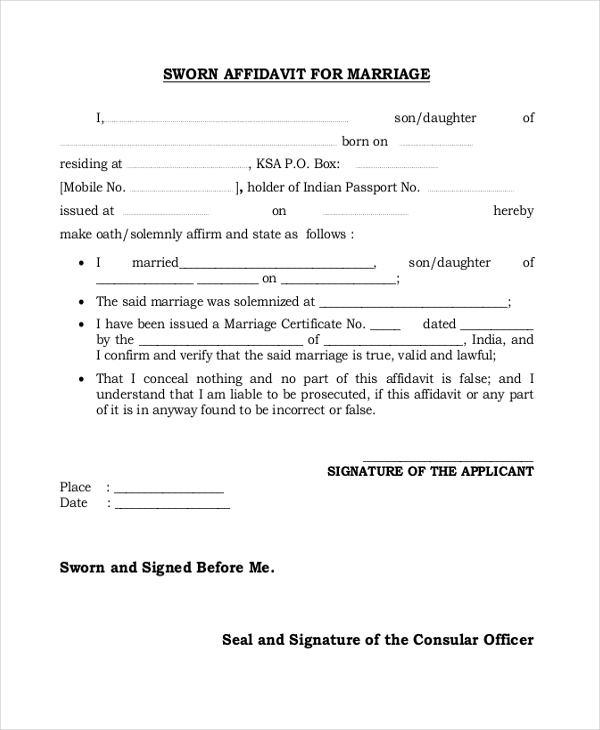 This form is suitable for providing general information about your marriage. It is the best form to use if you do not have the time to create the sample file from scratch. 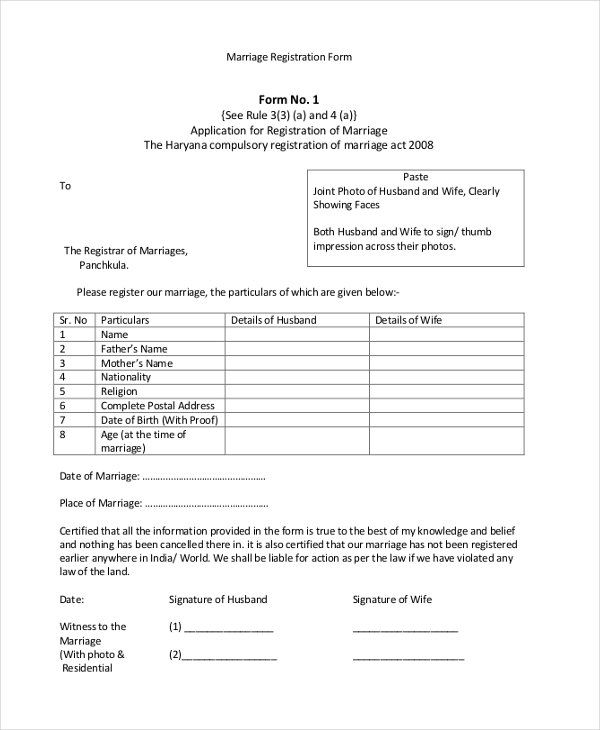 If you would like to use a marriage affidavit to prove that you are a legally wedded couple, here is a sample file that you can download and use. The sample file is available for free download. This is a one-page file. That means it should not be difficult to fill it out. At the end of the day, it will take you just a few minutes to get the form filled out. 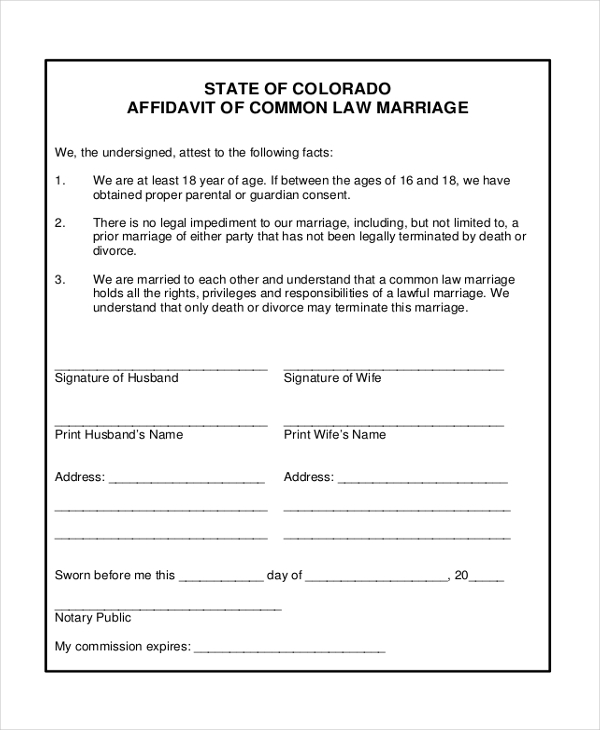 Why is a Marriage Affidavit Form Such a Big Deal? People may not believe that you are married. And this could create problems in an extended family in a way. While this may not appear in your community, it does surely happen somewhere else. While not philosophically speaking, that’s exactly why these files are a big deal. Overall, they provide proof when there is a burden of evidence and confirmation of a marriage. The sample file is useful because it helps you to provide the exact information that whoever is interested in it can read and get the conviction that the information you have provided is accurate and true. 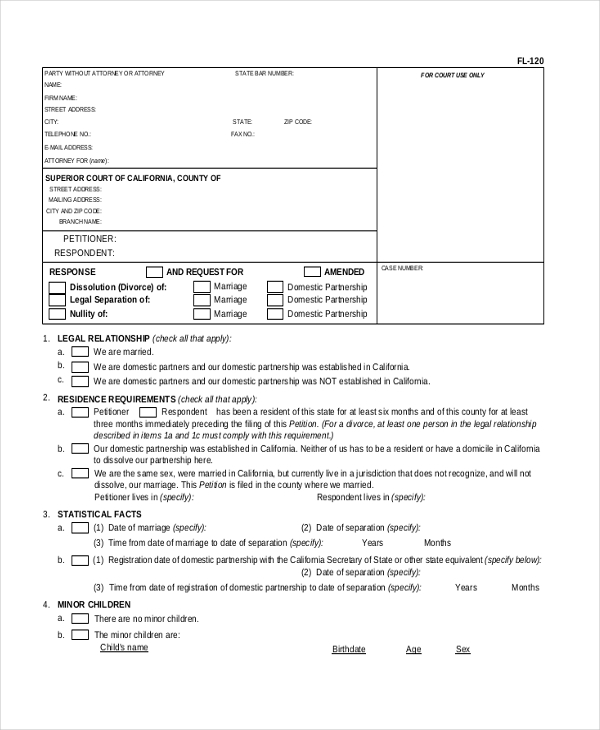 Why Should You Use these Marriage Affidavit Sample Forms? The sample forms are free to download. That means you are getting them for free. Moreover, you get them with a single mouse click. And that’s a good thing. At the end of the day, you don’t just save time. You save money and energy as well. Because these sample files are available for free download, it is important not to hire someone to create them for you. You can always use the money for something else. And, you do not have to tweak these or customize the templates. Use them as they are. 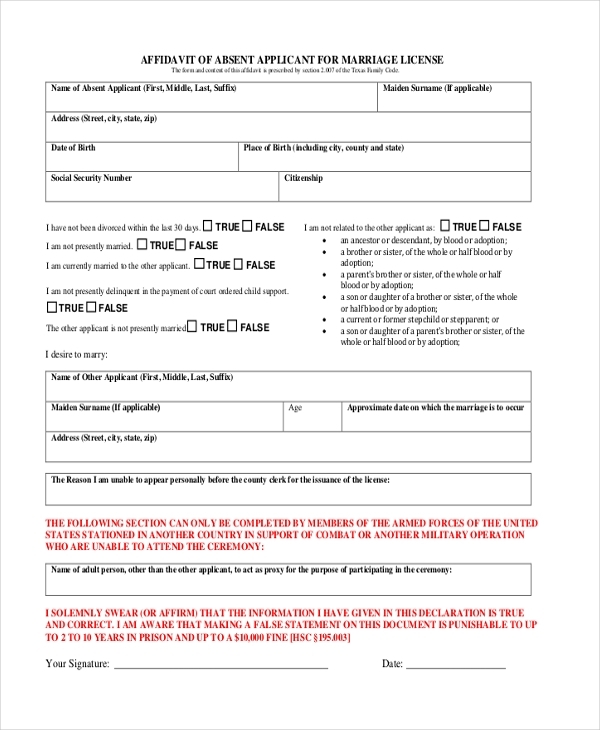 Should anyone question your marriage, or should there be a demand that you must give a confirmation of your marital status, these sample forms can help you a lot. At the end of the day, it is still important to insist that you can download the files for just $0.00.